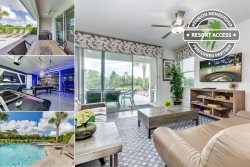 Reunion Vacation Homes makes it easy for you to find affordable and luxurious places to stay during your trip to Reunion Resort in the Orlando / Kissimmee area. The photographs of every single property outlined below is the actual property you would be reserving. To receive a detailed quote by email simply follow the "Contact Manager" button on of each of the property pages. Alternatively, click on the "Book-it-Now" button to see an all inclusive price and book on-line! If you have any questions, or if you would like to speak with us before reserving yourvacation rental, then give us a call toll free at 1-855-453-5400. We are more than willing to answer any questions you may have about the Orlando area. You can also email our reservation department at [email protected] We look forward to hearing from you and hope to make your Orlando vacation a special one! *Terms and Conditions:Minimum 4-night stay required. Cannot be combined with other discounts or specials. Must be requested at the time of reservation. Only valid on new reservations for arrivals and departures between June 1st, 2019 and September 1st, 2019. Subject to change and availability. Funfilled May 20% Off Select Properties *Terms and Conditions: Applies only to stays arriving and departing between the 1st and 31st of May 2019. Offer cannot be used in combination with any other promotional offer or discount. Minimum of 4-night stay is required. Not valid during peak or holiday seasons. Promotion only applies to new bookings. Subject to change and availablility. Browse our entire selection of luxury vacation rental properties located in Reunion Resort, Windsor at Westside, The Retreat at ChampionsGate, Solterra Resort, Windsor Hills, and Formosa Gardens. Find the perfect rental for your Orlando vacation. If you want to be a part of a resort experience during your unforgettable Orlando vacation, and you have learned to expect a certain quality from your vacation rentals, then you may be very happy with your choice to rent a Reunion Vacation Homes Orlando vacation rental. Luxury, elegance, and value are the keystones to our mission of making our guests happy. Renting a Orlando condo vacation rental allows you to take part in the perks of resort living, early tee times and poolside refreshments, and with many of our condos being spacious models with enough room for up to eight guests to sleep comfortably, you may find it difficult to remember why you need to return home at the end of your stay! Perfect for the Needs of Your Family One of the many advantages of condo living is the ability to move up. The higher the condo, the more incredible the view! Orlando is a beautiful city, one that is colorful, vibrant, and happy, and when you stay in a Orlando vacation condo for rent seven floors up, your view of your surroundings is unparalleled. Sitting on your covered balcony sipping wine as the sun sets behind nearby buildings just once will change your life forever. Inside, the spaciousness of the Orlando condo vacation rental may amaze you as it spreads out before you. Wood floors, plush carpet, or gleaming tiles that feel cool before your feet; you can expect only luxury materials to be used in a Reunion Vacation Homes Orlando vacation rental! The fully equipped kitchen is the heart of the home, and the richness continues in here. Granite countertops, custom cabinetry, and high-end appliances turn the chore of meal prep into a treasured activity when shared with your daughter. The living areas feature comfortable furniture, state of the art electronics, and oversized windows that fill the condos with light. The bedrooms contain premium mattresses with high thread count linens, the bathrooms hold white fluffy towels that actually cover your entire bodythe beauty is in the details we never overlook! When You Want to Play Outside There’s always something to do in Orlando, and if powerful animals, exciting rides, and spectacular shows catch your interest, we suggest you take a trip to Disney’s Animal Kingdom! Kilimanjaro Safaris give you an up close and personal glimpse into the wildest of nature’s creatures, Disney Musicals will bring a song to your heart, and if you have the extra time and money, you might want to consider a VIP behind the scenes tour of the kingdom. Take a walk on the wild side where not many have traveled before! *Terms and Conditions: Minimum stay required. Cannot be combined with other discounts or specials. Must be requested at the time of reservation. Only valid on new reservations on properties, arriving and departing between April 13th and April 30th, 2019. Subject to change and availability. Selection of our finest and updated luxury vacation rental homes. These properties are some of the best Orlando Vacation Rentals available near Disney. Sometimes special events in our lives have us looking for something a little more...well, everything! Larger, more luxurious, your Orlando vacation is going to be a celebration of that special moment, and the home you stay in should be a reflection of your monumental occasion! This is the time to start looking at our signature homes that offer all the amenities and conveniences of our standard homes, but with that something extra you’ve been searching for! Family reunions, destination weddings, and milestone birthdays will be made that much better when staying in a Reunion Vacation Homes signature rental; congratulations on making the right choice! What Can You Expect from a Signature Home? Elegant and grand, you know your celebration is going to be extra special at first glance if the name of the vacation home in Orlando FL somehow hasn’t already given that fact away. Between The Palace, Reunion Manor, Signature Estate, and Reunion Castle, when you want to be treated like royalty, this is where you and up to 33 guests need to stay! Marble floors, crystal chandeliers, wrought iron staircasessumptuous luxury is everywhere you look. The fully equipped kitchen, spacious living areas, and tranquil bedrooms with their cathedral ceilings and gilded beds are exactly what you would expect to find in a home of this caliber. Elegant, grand, and containing only the best appliances, electronics, and furnishings, you’re never going to want to leave. It’s the grand scale extras, however, that will convince you the correct choice was made. Find full-size interior basketball courts that double as ballrooms (grandma will feel like a queen at her 90th birthday celebration! ), theater rooms that contain leather reclining seating for up to 28 of your favorite people, and themed game rooms with surround sound, giant screened televisions, and private patios perfect for enjoying a cup of coffee as you watch the velvety night turn lighten with the rising of the sun. Can You Handle the Rest? If the interior is more than you could have hoped for, the exterior will overwhelm you! Olympic sized pools with dancing fountains, bubbling hot tubs, fully equipped outdoor kitchens, and an outdoor movie screen for pool party nights - we’ve thought of everything and it shows! Some Orlando vacation homes have golf course views, some have bonus safari rooms that allow you to sleep under the stars; remind us why you would ever feel the need to step off the property? Oh, right, the proximity to everything that makes Orlando special! 5-star restaurants, charming boutiques, and the Wizarding World of Harry Potter - Orlando has it all! Selection of our finest and updated luxury vacation rental condos. These properties are some of the best Orlando Vacation Rentals available near Disney. The wonderful thing about renting a vacation condo in Orlando from Reunion Vacation Homes is the knowledge that even larger families—or all big groups, for that matter, you can have a luxurious Orlando vacation without having to break the bank! With prices starting as low as $99 per night, our smallest condos sleep six comfortably, while the largest ones can handle nine, allowing you and your friends and family to save money for sightseeing and souvenirs! We offer rentals that are close to Disney World and/or near to all the wonder that is downtown Orlando. This vacation promises to be an exciting and adventure-filled one that won't break the bank! What is So Wonderful About Condo Living? Our vacation condos in Orlando arent just elegantly decorated units containing the ultimate in high end electronics and appliances; these vacation condos for rent in Orlando FL offer breathing room, amazing views, and the opportunity to partake in the luxury amenities provided by the resorts they are located in. Olympic sized pools, relaxing hot tubs, recuperative spas, even bicycle rentals and poolside bars are included in the price of your condominium. Casual Elegance When renting one of our Reunion Vacation Homes condominiums, our guests can expect to find the same casual elegance as they would in one of our private homes. Step inside onto wood floors that feel soft beneath bare feet as they guide and welcome you to your vacation paradise. The fully equipped kitchens are truly the heart of the vacation condo in Orlando, and these are spacious and bright, allowing for mother and daughter to create meals together without stepping on each others toes. The living areas are sumptuously furnished with comfortable couches and chairs and large coffee tables that are perfect for playing games or spreading out the puzzle pieces of the giant puzzle you can spend your vacation putting together. Furnished and covered terraces are perfect spots to sit with a glass of wine and enjoy the colorful beauty of a Florida sunset, but can also be the place where you choose to have dinner each night. Large bedrooms are havens of tranquility, and the bathrooms contain deep soaking tubs, custom tile work, and large fluffy towels that feel wonderful against slightly sunburned skin. Life is luxurious when you stay in a Reunion Vacation Homes condominium! Hitting the Streets Though you may be tempted to spend your entire vacation enjoying the splendors of your vacation condo in Orlando, we sincerely think you should spend some time getting to see the sights of Orlando! Take in an Orlando Magic Game at the Amway Center, enjoy a delicious meal at Lee & Ricks Oyster Bar, or just explore one of the many museums and art galleries that dot the Orlando landscape! Solterra Resort - Orlando Vacation Rental Homes. Family Vacation Rentals Close to Disney in Davenport, Central Florida. Fantastic resort amenities, kids will love the lazy river, parents will love relaxing in the hot tub. Enjoy food and drink from the poolside cafe. What more could you want! Choose from 5 and 6 bedroom homes alway the up to large luxury 14 bedrooms villas. Solterra offers the perfect balance of amazing value and great quality homes. Located just minutes from Orlandos theme parks, shopping, dining and other area attractions. Solterra resort is just a 5 minute (2.5 mile drive) from a Publix supermarket and other stores. There is also an Imax movie theater and many other stores such as Target located at Posner Park, just a 7 minute (4.2 mile drive) away. Enjoy unlimited access to all the resort has plenty to offer with a state of the art clubhouse, resort pool, hot tub, well-equipped fitness room, lazy river, tennis and volleyball courts, childrens playground and recreational area. There is also a poolside cafe when you enjoy food and drinks such as frozen cocktails! Browse the latest additions to our website If this is your first time visiting our site, you may not realize that we are constantly adding new Orlando area vacation rentals to our portfolio. We appreciate you choosing Reunion Vacation Homes and we want you to feel that you have a large selection to choose from; the more options you have the more likely you will want to come back again! Nothing is more frustrating than finding the home you love and discovering that it is booked for the next three seasons. With Reunion Vacation Homes, we will ALWAYS have something comparable or even better than the home you rented last year! Additionally, theres just something wonderful about that new rental smell, don’t you think? What’s New with Us? If you aren’t new to a Reunion Vacation Homes rental, you will understand what we say when we tell you that ALL our Orlando area vacation rentals will exceed your expectations in quality, comfort, and décor. There’s always something that seems unique about the new, however. Like the beginning stages of a relationship, everything seems brighter and more amazing. For example, let’s take a look at one of our newest vacation rentals in the Orlando area, Castle Pines Paradise. This villa is located off the 2nd hole of one our favorite local golf courses. Featuring four bedrooms and three and a half baths, your vacation will only be improved by staying here! Tile floors, stainless steel appliances, and a private pool with hot tub and basketball net all combine to create a haven you will never want to leave. The indoor/outdoor lifestyle is very important in Florida and the oversized arcadia doors in the living room make it easy enjoy by sitting in a comfortable patio chair, reading a good book, and drinking a frothy margarita. THIS is why you chose Orlando for your vacation destination. The bedrooms are bright and spacious sanctuaries of peace and light, the bathrooms large and spa-like, and the jetted corner tub in Castle Pines will soon become your favorite spot! Vacation Fun in Orlando While you may want to spend your entire vacation lazing around in your new Orlando area vacation rentals, it would be a shame to come all this way and miss out on the sights. Visiting the Charles Hosmer Morse Museum of American Art, for example, is one of our favorite ways of spending a few hours away from the office. Their collection of Tiffany Art Glass is incomparable! Sunny afternoons spent exploring Lake Eola Park relax and rejuvenate and offer wonderful photo opportunities. The swans that make their home on Lake Eola are just as breathtaking as you always imagined! Whatever your vacation interests are, you’re sure to find something that tickles your fancy when you visit Orlando! Windsor at Westside - New Vacation Rental Resort Near Disney. Orlando Vacation Rental Homes with Pools and Fantastic Resort Amenities New in 2016, Windsor at Westside is a gated vacation rental community close to Disney featuring a large clubhouse with the Tu Casa Bar & lounge, market & deli, video arcade, sundries shop & fitness center. Other fantastic amenities such as a playground, volleyball court & multi-purpose sports courts. Best of all is the large resort-style pool with lazy river, water playground with slides, cabanas, and tiki bar! This luxury vacation home is just eight miles from Disney World, Animal Kingdom and Orlandos world-famous attractions, shopping and dining. Our selection of BEST VALUE Orlando Vacation Rentals Enjoy the comfort and amenities of a select Vacation Home for a price similar or even lower compared to a hotel room. View our great selection of best value vacation homes in Orlando. Come, unwind and relax in the comfort of a great home that suits your budget. We are completely sure that you will enjoy the amenities, the privacy and all of the advantages of booking one of our best value rentals, perfectly located close to Disney and with easy access to all major attractions in Orlando, Florida. Condos with views of the golf course, townhomes with jetted tubs, private homes with a pool and hot tubs - there are no downsides to renting one of our Best Value Rentals. Tile floors, granite countertops, and stainless steel appliances provide a luxury vacation experience you wont believe is covered by the low per night costs! Planning a family reunion? Rent our 7-bedroom, 5-bathroom Oasis Dream Villa that sleeps 14 people for only $265 a night. Divide the costs between all families and you may want to move in for the duration; owning a home isnt this inexpensive! What Do You Do When You're in Orlando? Always exciting, Orlando is a tourist destination favored by millions over the decades, and not just because its home to the most famous mouse in the world. Mickey Mouse does draw his own share of admirers, but the beautiful weather, fabulous shopping, and hopping nightlife attract even more! Book Your Reunion Vacation Homes Rental Today! A good vacation doesnt necessarily have to drain your bank account, especially when you stay in one of our Best Value Rentals! Contact us today to book your stay. Solara Resort Vacation Home Rentals close to Disney World, Orlando Florida. This ultimate vacation resort is complete, however, new homes are in development. Only 8 miles to Disney and within a short drive to Universal, Disney Springs, and many local beaches, this gated resort community is in the center of it all! An extensive amenity complex will be the heart of Solara Resort and will include luxuries to satisfy every member of your family, including a splash pad, teen hangout, and bar. Clubhouse & Amenities Solara Resorts Grand Clubhouse will feature a resort pool, FlowRider® Surf Simulator (*Fee Required), bar and grill, coffee shop, sundries store, fitness center, outdoor fitness lawn, indoor and outdoor lounges, workstations, tween/teen hangout center and much more. Recreation Have some fun in the sun and challenge the family to a game on the basketball court, beach volleyball court or full-size soccer field! Cool down in style and enjoy one of Solara Resorts water amenities such as the expansive resort pool, separate childrens splash pad, and more! Luxury vacation home rentals in Reunion Resort and Formosa Gardens close to Disney. From 9 to 15 bedrooms Orlando villas. You cannot beat the experience of staying in a luxury villa. Get your family and friends together and come visit the Orlando area and its world-class attractions. Wind down in your own private pool in-between all of the fun. That special someone in your life has a momentous occasion coming up - your oldest daughter is getting married, your grandmother is turning 90, or maybe you and your spouse are about to celebrate wedded blissbut you can’t decide how to acknowledge this grand occasion. You could rent the Legion Hall and have a perfectly fine time commemorating the occasion at home, working your fingers to the bones for weeks in advance to ensure everything is just perfect, or you could rent one of our luxury vacation villas in Orlando FL that sleep up to 34 guests comfortably, and spend those same weeks tanning, working out, and shopping for new swimsuits, perfect for hanging out by the pool in your luxury villa rental in Orlando Florida. Keep It Intimate with 18 guests That destination wedding your daughter has always dreamed about doesn’t have to be overwhelmingly large; a smaller, more intimate wedding can result in the best memories, and the price for intimate can fit in most family’s budgets. One of our 9 bedroom homes can be rented for just $325 a night! Featuring five full bathrooms in addition to the nine bedrooms, this stucco and tile-roofed home also offers a full-size pool and screened in lanai perfect for night swimming, a game room with foosball, pool, and air hockey, and large flat screen televisions in nearly every room; the one in the main living area is 50 inches and theater-quality! Go All Out with 34 of Your Closest Friends! 14 individual suites can hold a lot of people, and our largest homes are designed especially for that momentous occasion! Majestic staircases with elegant iron railings, travertine tile floors, and granite countertops are just the beginning. The massive dining room table seats 30, the theater room filled with sumptuous red leather recliners seats 16, and the game room features arcade games, foosball, pool, and a mini-kitchen - we’ve thought of everything! Outside a full-size pool and hot tub are located just off the giant covered patio that opens into the living area and individual balconies for each of the suites, offering intimate spots for sunset watching. Keeping 34 People Occupied is Easy! Day trips to Disney, night forays out on the town, and any time spent on International Drive allow for a destination wedding/birthday celebration/golden anniversary celebration that won’t soon be forgotten! We recommend a night at the Improv to help take the edge off any last-minute wedding jitters. Laughter IS the best medicine for all that ails you, by the way! 8 Bed Vacation Villas in Reunion Resort, The Retreat at Champions Gate and Windsor at Westside When youre looking for a Orlando vacation home rentals with a little extra space for breathing room, you cant go wrong with one of our luxurious eight bedroom units. Ideal for the large family or for people with a lot of close friends, these homes contain everything needed for the perfect Orlando Vacation. Why stay in a sterile hotel, crowding multiple people into rooms that should only hold two people at the most when you can stay in Reunion Vacation Homes rental and live like royalty? Our guests are important to us, and it shows in the quality furnishings, the elegant yet cheerful décor, and the reasonable prices we charge. Save your hard-earned cash for haute cuisine dinners, Disney souvenirs, or road trips to the beach; our eight bedroom Orlando vacation home rentals begin at $320 a night! Reunion Luxury Anyone who has stayed in one of our Orlando, Florida vacation home rentals knows we mean it when we say our goal is to spoil our guests. Our homes are luxurious, elegant, and happy places designed to give you vacation memories that will linger for years to come. Cobblestone driveways lead up to stucco and tile-roofed homes that hint at the wonders you will find inside. Open the heavy wood door and let your vacation begin! Once inside, cool tile floors invite you to take off your shoes and explore the kitchens that are the heart of the Orlando vacation home rental. Stainless steel appliances, granite countertops, and custom cabinetry make meal preparation in these fully equipped kitchens a joy, not the chore they always manage to be back home. The dining rooms are large, some containing one large communal table, others containing multiple tables, allowing for restaurant style dining. Game rooms with comfy couches, bathrooms with both walk-in showers and deep soaking tubs, living areas with state of the art electronics, bedrooms with premium mattresses and views of the beauty that is an Orlando landscape-these homes are meant to be lived in and enjoyed! Out and About in Orlando Even though you may be tempted to stay in and partake in the luxurious extras that can only be found in a Reunion Vacation Homes rental, we suggest you venture out at least a few times during your stay! Children of all ages will thrill to be behind the wheel of a NASCAR-themed electric Go-Kart at I Drive NASCAR, and gyros and ouzo arent the only things on the menu at Taverna Opa; belly dancing lessons are offered for the daring adventurers in your family. Finally, swimming with the dolphins at Discovery Cove will be the highlight of your Orlando vacation. Our town has it all! 7 Bed Vacation Rental Pool Homes | Orlando Villa Rentals When having that large family gathering, knowing there are plenty of beds for all your guests is important. No one wants to spend their week in paradise sleeping on a blanket on a hard floor. Our Reunion Vacation Homes 7 bedroom vacation homes in Orlando ensure that at the very least, 14 family members will have a soft comfy bed to sleep in, and one of our homes actually has sleeping space for 18 people! The second most important option in a large Orlando Florida vacation home rental is bathrooms. 14 people sharing just two bathrooms can be an experience you wont care to repeat. Fortunately, when you rent a Reunion home, the lack of bathrooms is a non-issue, and our 7 bedroom Orlando vacation homes have anywhere from five bathrooms to a whopping seven and a half spacious and spa-like ones. No one understands the needs of vacationers like Reunion Vacation Homes! Surround Yourself in Luxury From the initial turn of the key that leads you into one of our 7 bedroom Orlando vacation homes to the final thud of the front door shutting behind you at the end of your trip, you will find yourself luxuriating in the elegance of your Orlando getaway. Grand entrances decorated in shades of champagne and gold, spacious kitchens filled with warm wood tones, cool granite counters, slick stainless steel appliances, and living areas stocked with plush couches and overstuffed chairs invite you to stay a little while longer; this is just a part of what makes a Reunion Vacation Homes rental so very special. Pops of colors in vibrant reds, brilliant plums, and warm shades of peach will draw your eyes from focal point to focal point. That red suede chair for two strategically placed under the shiny silver reading light, a soft purple cashmere throw casually draped across the corner of a premium mattress, or the peach floor to ceiling curtains in a living area that guides your attention to the views of the golf course outside the windows of your dream Orlando, FL vacation home -why would you even think about staying anywhere else? But Wait, Theres So Much More Swimming pools, hot tubs, and game rooms filled with a mix of the vintage arcade games from your youth and modern, full-screen theaters with state of the art electronics for the ultimate movie experiencethis is just the beginning of all the fun you can have here! Disney World is only six miles away, Madame Tussauds world famous wax museum, kayak eco-tours...the list of adventures you can have in Orlando is limited only by your physical abilities and your imagination! Sonoma Resort in Orlando, Florida offers luxury resort amenities such as a clubhouse, resort-style pool, and cabanas. Windsor Hills Resort - Orlando vacation home rentals just two miles from the magic of Disney. If the morning view from your bedroom window contains gloomy and sunless skies, slushy and sleet filled roads, and a thermometer that struggles to reach the double digits, its time to stop dreaming and start planning your Orlando vacation in one of our luxurious six bedroom vacation homes in Orlando Florida with a pool. Close your eyes to the gloom outside your window, and imagine that Florida vacation in a Reunion Vacation Homes luxurious rental - playing games with the family, creating gourmet meals in the chefs kitchens, and floating lazily in the pool, soaking up rays with an ice cold adult beverage in hand. THIS is the lifestyle you could rapidly become accustomed to - what are you waiting for? Elegant Interiors with a Splash of Fun Elegance doesnt have to mean sterile and boring. The warmth of our six-bedroom vacation homes in Orlando invites you to come inside and stay awhile. Unpack your suitcases, take off your traveling clothes, and just breathe. Amateur chefs will discover the joys of creating gourmet meals in our fully equipped kitchens containing granite countertops, custom cabinetry, and stainless steel appliances. Overstuffed chairs strategically placed near generously sized windows that let in plenty of light are perfect reading corners in the living areas. Competitive teens will enjoy a healthy dose of sibling rivalry playing foosball in the game rooms, tired toddlers will rest joyfully in the Harry Potter-themed childrens rooms, and everyone will enjoy a day of fun in the pool as they frolic happily under the Orlando sun, where screened-in lanais keep the creepy crawlies out! Our staff at Reunion Vacation Homes treasures their guests, and it shows in the quality, cleanliness, and style that is evident in all our vacation homes Orlando Florida. Our attention to detail means that none of your needs will be overlooked! Adventures for the Entire Family While it may be tempting to stay home and play, the adventures you can have during your Florida vacation will make going out and about very much worth your while! The over 21 crowd will enjoy the pleasures of an evening out at Carmel Caf & Wine Bar. Tired moms can recharge at one of the many spas in the area; our favorite changes daily, but for today, we are digging the Poseidon Spa at the Grand Bohemian Hotel. While Mom is recharging, Dad can hit the links. Orlando is home to many world-class golf courses, and some of our Reunion Vacation Homes vacation pool homes Orlando Florida sit on the best in town! 5 Bed, Reunion Pool Homes. Rates Starting at: $185.00 a Night When staying in a Reunion Vacation Homes five-bedroom vacation house in Orlando, you can count on being spoiled against any other vacation accommodations. We cherish our guests, and it shows in the details that most hotels and other vacation property management companies overlook. Elegant, classy, and stocked with only the best in furnishings, appliances, and electronics, your Orlando vacation promises to be an unforgettable one when you stay in one of our stunning vacation houses in Orlando FL. When you come back home tanned, relaxed, and smiling, youll know you made the right decision! Five bedrooms, five bathrooms, and a pool to frolic in during long and lazy vacation days; were not bragging when we say your Reunion vacation home is guaranteed to be the highlight of an already fantastic getaway! Step Inside and Unwind With prices that start at $165 per night, ranging up to a maximum of $410 per night, we have vacation houses in Orlando that fit everyones budget! Tile floors, vaulted ceilings, and ceiling fans in every room ensure that every member of your family will remain cool and comfortable, even during the hottest days of summer. Velvet sofas sit lightly upon plush carpeting in the living areas, while youll find granite countertops, stainless steel appliances, and custom cabinetry in the kitchens. The bedrooms that are havens of peace and tranquility; these are the reasons you will never stay anywhere else! Harry Potter-themed game rooms add a sense of whimsy inside, while pools, spas, and outdoor kitchens mean that you will want to play, live, and explore every inch of these fabulous abodes. No detail has been overlookedeven the towels in the spacious and spa-like bathrooms are extra soft and extra fluffy. Visitors often end up with sunburns, and we dont want them feeling uncomfortable by having to use scratchy towels! Venturing Out on the Town One of the more wonderful things about our favorite town is the sheer abundance of variety of adventures you can have during your stay. Orlando is more than the town the mouse built; it is a vibrant and bustling city that attracts people from all over the world. ICEBAR Orlando, the states first and only bar made out of ice, offers a unique nightclub experience you will be able to brag about for years to come. Created out of 70 tons of ice, this is one spot that will help keep you chill! The Wizarding World of Harry Potter is a new attraction that has rapidly become the areas 2nd most popular amusement park. The opportunity to ride on the Hogwarts Express is a huge thrill for fans of the book! 4 Bed, Vacation Rental Pool Homes. Orlando Villas Close to Disney Sometimes the best vacations are the ones spent with a group of people who are closest to youthe cousin you grew up with, the neighbors you clicked with and basically raised each others children together, the college friends who knew you way back and still like you now. These people are the backbone of your life, why wouldnt you want to go on adventure with them? Our Reunion Vacation Homes four bedroom Orlando vacation rentals with private pools are large enough that each traveler has space to breathe, but also allows them to come together for communal meals. The kitchens are large enough for multiple chefs. You can also enjoy crazy fun spent frolicking by the pool. If you dont have your own pool at home, you will rapidly begin to understand the attraction! What to Expect from Your 4-bedroom Vacation Home Anyone who has previously stayed in a Reunion home might be expecting a certain level of quality and style out of their home, and they would be right. From your first glance of the stucco and tiled roof of the exterior as you drive up the cobblestone driveway to the final glimpse in your rear-view mirror as you reluctantly drive away at the end of your stay, THIS will be the model of your ideal vacation home rental, not just in Orlando but everywhere you go for the rest of your life. Wood, tile, and plush carpeted floors throughout, cool granite countertops, and the warm colors on the walls are just some of the details that show our commitment to quality. Gourmet chefs kitchens, spacious living areas with high-end furnishings, and large bedrooms that are sanctuaries of peace and tranquility invite you to come in, sit down, and relax. Youve had a long trip and we want to take care of you! This is going to be a vacation that is all about you and your needs. Dont you deserve it? Adventures in Orlando You could spend your entire vacation exploring the playground that is your Reunion Vacation Homes rental, playing pool in the game rooms, swimming in the pool in your private backyard, or sitting on your covered terrace enjoying a glass of wine as the sun sets in a blaze of vibrant and fiery colors. As fun as our Orlando vacation rentals with private pools can be, you may want to venture out to explore the world famous attractions in Orlando! For those times, you will soon discover that Orlando offers more than Disney. Take in a Blue Man Group Show or drop in the Blue Martini for a sophisticated evening of fun and drinks. Put on your hiking shoes and explore the Bill Frederick park, or put on your shopping shoes and head to Zou Zou and check out the shoes they offer there! Theres always something to do in Orlando! 3 Bed, Reunion Properties. Rates Starting at: $95.00 a Night Life can be a stressful mixture of late meetings, fast food meals eaten on the go, play dates, sick kids, school events, and hurried hellos and goodbyes as you pass your family members on your way to somewhere else. Isnt it time you took a break to recharge and renew the family bonds that have been stretched way too thin? An Orlando vacation promises sunny days, exciting adventures, and fun family times in one of our three-bedroom vacation homes. Its the perfect way to take some time for you! And best of all, we at Reunion Vacation Homes do not believe that a family vacation has to be an expensive affair that drains your bank account, and it shows in the price of the vacation homes rentals in Orlando, Florida we offer. Luxury doesnt have to be expensive; save your dollars for souvenirs and sightseeing! The Homes Charming wood-sided homes with shutters and a pool, modern condos with gleaming tile floors and views of the nature preserve, or cozy townhomes with views of the golf course - whatever your style, whatever your price level, the difficult part will be narrowing down your choice to just one! Walk inside and fall in love. Tile floors lead you to the fully equipped kitchen filled with high-end appliances, custom cabinetry, and cool granite countertops. Move onward to the living room and take a seat on velvet covered couches and overstuffed chairs that beg you to open a book and read for a while by the light of the oversize windows. The indoor/outdoor lifestyle is very important when you live in a climate that is perfect year-round, and the generous sliders open up completely to completely furnished covered porches; al fresco dining has never been so luxurious! Tranquil bedrooms, spa-like bathrooms and more all combine into a luxurious experience. We want our guests to feel special, and it shows in the details. These vacation homes rentals in Orlando envelop you with warmth and style. Out and About in Orlando Staying home is a wonderful experience, but going out can be just as incredible! Our vacation homes rentals in Orlando are located near the heart of everything that makes Orlando the exciting and vibrant town it is! Golf fans will thrill at the opportunity to play the Reunion Resort Golf Course; some of our vacation homes rentals in Orlando offer views of the Arnold Palmer/Legacy Course at the Resort, ranked at the number 8 spot of best golf courses by Golf Magazine! For those less committed to the perfect game, Congo River Golf has been voted Orlandos number one miniature golf. Orlando has something for everyone! Large selection of spacious 3 Bedroom Condos & Town Homes Its important to not overlook the values and luxury found in a Reunion Vacation Homes 3-bedroom condo or townhouse. Many of these Orlando vacation condo rentals are just as large as a private home, and all are just as luxurious as those same private homes; the only difference is the proximity of your neighbors and the lower price points! Sleeping up to eight people comfortably and featuring an equal number of bathrooms in many of the properties, your Orlando adventure promises to be an unforgettable one. Just be sure to pack light; youre going to want room for the souvenirs you bought with your accommodations savings! Classic Elegance with Whimsical Style Staying in the Reunion Resort means you will have access to all the community amenities that make vacations so much fun, while still having plenty of room to roam in your luxury Orlando Townhomes! Wood plank floors, plush carpet, or gleaming tiles that feel cool beneath your feet lead you into your charming Orlando vacation condo rental home away from home, straight to fully equipped kitchens, spacious living rooms, and cozy bedrooms that are havens of peace and tranquility. High-end appliances in the kitchens of these Orlando townhomes allow you to easily fix a homemade meal, showing your love for your family and your financial acumeneating in saves money! Spacious living areas feature large flat screened televisions and plenty of seating for larger families. Spread out a puzzle on the coffee table in front of the leather sofa and take your time putting it together throughout your stay (and dont forget to take a picture of the finished product!). Covered patios offer intimate areas to dine al fresco or simply enjoy a Florida sunset with the ones you love most. This is what a Florida vacation is all about. Only happy dreams are allowed in our serene bedrooms, furnished with premium mattresses that are topped with high thread count linens. Sleeping in is an option we dont have much of in real life; we want to make sure you can take advantage of that luxury here! Venturing Out Family time is special, and while youre visiting our fair city, youre going to want to take advantage of all the family activities we offer! Universal Studios is another theme park option (in addition to the obvious visit to Disney World). Enjoy behind the scenes glimpses of the make-believe world of movies as you ride exciting roller coasters, enjoy tasty food, and maybe experience the opportunity to star in your own show! Or, for a unique perspective of the city you are visiting, you can charter a helicopter from Air Florida Charters and soar high above the town for a once-in-a-lifetime vacation adventure! Homestead is surrounded by the Tom Watson Independence golf course, offering stunning golf course views. Homestead is made up of the following streets: Astina Street, Devereaux Street, Gathering Court, Gathering Drive, Gathering Loop, Molona Street, Oconee Street, Radiant Street, Soiree Way, Sparkling Court, Veilleux St.
1 & 2 Bed, condos located in Seven Eagles and the Reunion Grande. Rates Starting at $95 / Night Whether you are needing an intimate getaway with the love of your life or your small family is long overdue for a vacation, our Reunion Vacation Homes one and two bedroom Orlando vacation condos offer the opportunity for the vacation of a lifetime without siphoning away your hard-earned dollars. We understand how hard you worked to save for your vacation fund and we also feel that you deserve to be spoiled.We love our guests and it shows in our Orlando vacation condos & homes. Its the little details that are so important and so ignored by other Orlando vacation rental property management companies that have our guests returning year after year. Bose sound systems, 50-inch flat screen televisions, and free Wi-Fi are just a few of the luxury extras you can expect from your Reunion Vacation Homes rental. Keep reading to learn what other amenities you will find in your vacation paradise! Reasonably Priced Doesnt Mean We Forego the Extras Even our smallest Orlando vacation condos offer the little extras you will learn to expect from your Reunion Vacation Homes condominium. Golf course views, plush carpet in the bedrooms, cool tiles in the hallways, and high-end appliances that are a joy to use are just some of what youll find in our exquisite homes. Preparing family dinners is no longer a chore, but a luxury! Living areas are large and bright, with the light of the cheerful Florida sun pouring through the oversized windows that offer unparalleled views of the beauty outside. Spend a rainy night watching movies on the extra-large flat-screened television in the living room or enjoy a cool, refreshing beverage on the covered patio as you watch one of Mother Natures most spectacular shows: a Florida sunset. The bedrooms of the Orlando vacation condos are tranquil spots, perfect for sleeping in after a long night out on the town. Heavy silk curtains can be pulled tightly shut to keep the light out while you sleep just a little longer. The bathrooms are spacious and spa-like, and soaking in a deep tub after a long day of sightseeing is an experience you will want to repeat time after time. Vacation life doesnt get much better than this! Running Around Town Escapology on International Drive in Orlando is just one of the fun activities our town has in store for you and your entourage. Groups of up to five people are locked away in a room and must solve the puzzles to earn the key to escape, leading to a few hours of hilarity. The Cuba Libre Restaurant & Rum Bar is just down the street, offering a unique place to celebrate your own liberation; try the Mojitos, they are out of this world! Masters Landing Luxury Estate homes in the West-side of the resort from $410 / night. 3 Bed, Townhomes located in Seven Eagles, Heritage Crossing, and Carriage Pointe. Each of these neighborhoods has it’s own community pools. There’s a lot of confusion about the difference between a condominium and a townhome, but after looking up the definition, we think we have found the answer: A condo may share ceilings, floors, and all walls on every side with their neighbors, while a townhome is supposed to have only 1 shared wall, giving the appearance of being a single-family residence while saving valuable land space. Vacationing in a townhouse offers more privacy, and sometimes more space than a condo and the costs are usually very similar, so if you’re worried about your personal herd of elephants destroying the peace of the condo inhabitants on the floor below you, maybe a vacation townhouse is the direction you should be headed! Keep reading for information on some of the townhomes for rent in Orlando we at Reunion Vacation Homes have available and start planning your unforgettable Orlando vacation! Our Reputation is Very Important to Us You can rest assured that even though the costs per night may be lower than you imagined it would be, luxury, comfort, and elegance are still one of our main priorities. Our guests’ happiness and satisfaction is our TOP priority, of course! Stepping inside one of the Reunion Vacation Homes luxury Orlando townhome that we have for rent for the first time will always be a treat. Gleaming tile floors, warm wood planks, and plush carpeting that is soft beneath your feet are examples of the luxury materials we use in our decors. The fully equipped kitchens will be spacious and filled with custom cabinetry, granite countertops, and high-end appliances in perfect order. Eating out for every meal can be tiresome and expensive; we understand that you are going to want to stay in once in a while, and we want to make it easy for you! Living areas will contain quality furnishings topped with luxury materials; suede, leather, velvet, and chenille are soft to the touch and make for comfortable lounging spots! The bedrooms are tranquil havens where sleep reigns supreme. Only happy dreams are allowed here! The bathrooms will be large and spa-like. After all, spoiling you is what we do best! You Could Stay Inside If You Wanted Some of our end unit townhomes for rent in Orlando have their own private pools, and spending a day splashing around in privacy is a fun way to kill time during vacation. But when you know the Kennedy Space Center is only a short drive from your front door, doesn’t that make you want to explore new frontiers? Check out where American space history began. The Rocket Gardens are majestic and the next rocket launch is scheduled for March 27th. Visiting during a launch is guaranteed to be the highlight of your vacation! Selection of 1, 2 and 3 bedroom luxury condo’s located in Reunion Resort If you want to be a part of a resort experience during your unforgettable Orlando vacation, and you’re of the mind that more neighbors just mean more opportunities to make friends, AND you have learned to expect a certain quality from your vacation rentals, then you may be very happy with your choice to rent a Reunion Vacation Homes condominium. Luxury, elegance, and value are the keystones to our mission of making our guests happy. Renting a condo allows you to take part in the perks of resort living, early tee times and poolside refreshments, and with many of our condos being spacious models with enough room for up to eight guests to sleep comfortably, you may find it difficult to remember why you need to return home at the end of your stay! Perfect for the Needs of Your Family One of the many advantages of condo living is the ability to move up. The higher the condo, the more incredible the view! Orlando is a beautiful city, one that is colorful, vibrant, and happy, and when you stay in a condo seven floors up, your view of your surroundings is unparalleled. Sitting on your covered balcony sipping wine as the sun sets behind nearby buildings just once will change your life forever. Inside, the spaciousness of the condo may amaze you as it spreads out before you. Wood floors, plush carpet, or gleaming tiles that feel cool before your feet; you can expect only luxury materials to be used in a Reunion Vacation Homes rental! The fully equipped kitchen is the heart of the home, and the richness continues in here. Granite countertops, custom cabinetry, and high-end appliances turn the chore of meal prep into a treasured activity when shared with your daughter. The living areas feature comfortable furniture, state of the art electronics, and oversized windows that fill the condos with light. The bedrooms contain premium mattresses with high thread count linens, the bathrooms hold white fluffy towels that actually cover your entire bodythe beauty is in the details we never overlook! When You Want to Play Outside There’s always something to do in Orlando, and if powerful animals, exciting rides, and spectacular shows catch your interest, we suggest you take a trip to Disney’s Animal Kingdom! Kilimanjaro Safaris give you an up close and personal glimpse into the wildest of nature’s creatures, Disney Musicals will bring a song to your heart, and if you have the extra time and money, you might want to consider a VIP behind the scenes tour of the kingdom. Take a walk on the wild side where not many have traveled before! Luxury Vacation Homes in the West-Side of Reunion. 3 Bed, Reunion Centre Court Ridge Condos. Close to the center of Reunion resort including the restaurants and 11th floor pool in the Grande and the Seven Eagles pavilion and pool. From $125 / night. 3 Bed, Town-homes from $150 / night and 1 Bed condos from $95 / night. Located in the heart of Reunion Resort. Seven Eagles has an Infinity pool, hot tubs, fitness room, bar and grill, games room and golf views. 3 Bed, Condos located in The Villas South neighborhood of Reunion Resort with a community pool and play ground. Neighborhood is made up of Cabana Court and Whisper Way. From $115 / night. 3 Bed, Condos located in The Villas North neighborhood of Reunion Resort with a community pool. Neighborhood includes Sunset View Circle and Sandy Ridge Drive. From $115 / night. 3 Bed, Town-homes, and Condos located in the Heritage Crossing neighborhood of Reunion Resort. Stunning golf course views and two community pools. From $95 / night. Carriage Pointe is a Reunion Townhouse community adjacent to the 17th Hole of the Independence golf course designed by Tom Watson. This gated community has its own separate beautiful community swimming pool and hot tub. Offering great value for money from $95 / Night! 15% Off New Years Special *Terms and Conditions: Minimum 4-night stay required. Cannot be combined with other discounts or specials. Must be requested at time of reservation. Only valid on new reservations made between December 26, 2018 until January 10, 2019. Not valid during holiday seasons. To book during Peak Season please call our dedicated reservations team 1-866-314-7386. Subject to change and availability.